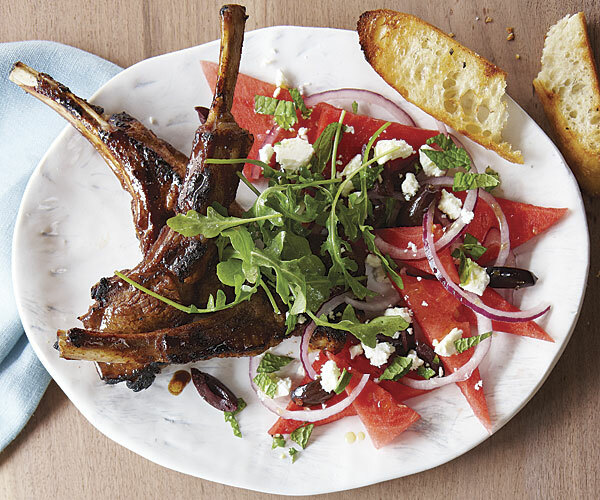 The lamb is packed with arginine and zinc, and the watermelon is rich in vitamin C, which is essential for proper sperm production and male fertility. Combine 1 tbs of the oil, vinegar, rosemary in a jug. Lay chops into a ceramic dish and pour over marinade. Turn chops to coat well. Cover and set aside for 30 minutes. Brush haloumi slices with olive oil. Heat a chargrill pan over medium-high heat. Cook haloumi for 2 minutes on each side or until golden. Transfer to a plate. Cool slightly and tear into pieces.